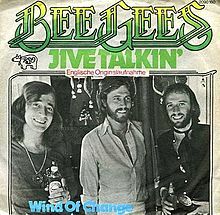 Одна из лучших песен Bee Gees. « It's just your jive talkin'. You're telling me lies, yeah. Jive talkin', you wear a disguise. Jive talkin', so misunderstood, yeah. Jive talkin', you're really no good. You're gonna take away my energy. With all your jive talkin', you're telling me lies, yeah. Good lovin' still gets in my eyes. Oh, my love, you're so good at treating me so cruel. Leavin' me lookin' like a dumbstruck fool. Jive talkin', you just ain't no good. You know now, love talkin' is all very fine, yeah. Jive talkin', you're telling me lies, yeah.